She resides with her Swedish boyfriend Tomas Söderberg in Austria, and like most German Nordic skiers, is in the military as a border patrol guard. Their first child Hanna Ursula was born on January 15, 2007. 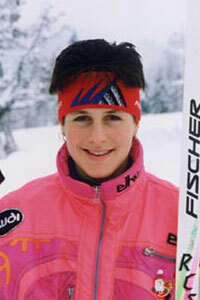 During her competitive career Disl was a 19 year veteran of biathlon and was a five time olympian, with two Olympic gold medals from the 4 × 7.5km relays in 1998 and 2002. She also has four silver medals (two in 7.5 km sprint (1998 & 2002), one in 4 × 7.5 km relay (1994) and one in 3 × 7.5 km relay (1992)), and three bronze medals (two in 15 km individual (1994 & 1998) and one in 12.5 km mass start (2006)). She also has two World Championship titles, both won in Hochfilzen, Austria in March 2005, in the 7.5 km sprint and the 10 km pursuit. Dubbed 'Turbo-Disl' by the German media she lay second in the Biathlon World Cup table at the beginning of the Olympics behind fellow country woman Kati Wilhelm, and finished fifth in the overall standings for the 2004-2005 season. She has finished 2nd overall thrice in the Biathlon World Cup (1995/96, 1996/97, and 1997/98) and has won 40 World Cup races (28 single & 12 relay/team victories). This includes three wins at the Holmenkollen ski festival biathlon competition with one in 1995 (sprint) and two in 1996 (sprint, pursuit). 2006 was Disl's last Olympics and her final season. She plans on becoming a TV commentator on biathlon. On December 18th 2005 Disl won "German sportswoman of the year", becoming the first biathlete to do so, and beating speed skater Anni Friesinger and discuss thrower Franka Dietzsch. Disl is also a three-time winner at the Holmenkollen ski festival's biathlon event, winning the 7.5 km sprint in 1995 and both the sprint and the 10 km pursuit events in 1996.